FIIs were net sellers of equity on all three trading days this week. Their total net selling was worth Rs 12.7 Billion. DIIs, who were also net sellers of equity on Mon. and Tue. (Feb 11 and 12), were net buyers today. Their total net buying was worth Rs 3.6 Billion, as per provisional figures. India’s CPI-based retail inflation eased to a 19 months low of 2.05% in Jan ’19 from a revised 2.11% in Dec ’18, and was much lower than 5.07% in Jan ’18. Negative food inflation was the main reason for the low inflation number. IIP (factory output) showed a 2.4% growth in Dec ’18 from 0.3% in Nov ’18. IIP was 8.4% in Oct ’18. For the Apr-Dec ’18 period, IIP growth was 4.6% over Apr-Dec ’17. On Wed. Feb 6, the index had closed at 11062.50 – just above the upper Bollinger Band. The next day, it touched an intra-day high of 11118, but formed a ‘doji’ candlestick by closing at 11069. Failure to close above 11090 despite two successive attempts, combined with piercing of the upper Bollinger Band followed by a ‘doji’ formation gave a clear indication that the intermediate rally from the Jan 29 low of 10583.65 was coming to an end. FIIs, who had led the intermediate rally, turned bears. So did DIIs. Their combined selling has dropped the index below its 20 day SMA (middle band – marked by blue dotted line) and 50 day EMA. 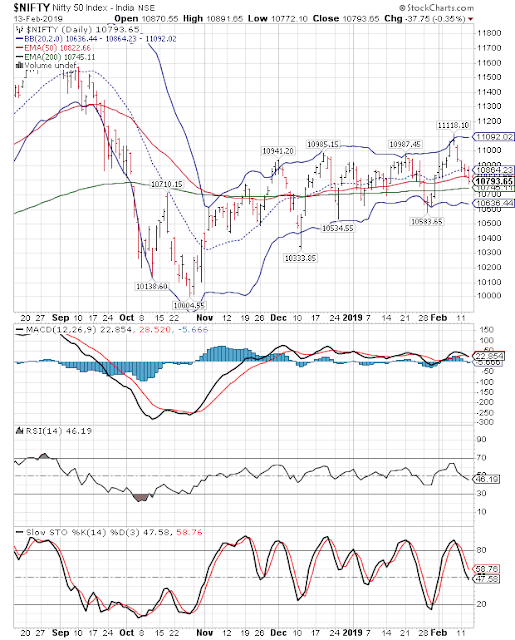 Looks like Nifty may be headed below its 200 day EMA towards the lower Bollinger Band. Daily technical indicators are looking bearish and showing downward momentum. MACD has crossed below its signal line in bullish zone. RSI and Slow stochastic have slipped below their respective 50% levels in neutral zone. Some more downside is likely. Nifty’s TTM P/E has moved down to 26.6, after touching 27.41 on Feb 7 (its highest level in 2019) – but remains much higher than its long-term average in overbought zone. The breadth indicator NSE TRIN (not shown) is oscillating inside oversold zone – hinting at some more near-term downside. Shares of companies declaring Q3 results below expectations are getting hammered by bears even if they are making profits. A handful of companies whose results have surprised positively have seen their stock prices going through the roof. The environment is not conducive for small investors to make much money. Mid-cap and small-cap stocks continue to bear the brunt of bear attacks. Even large-caps are tumbling down. Market volatility is unlikely to abate before elections. With bank fixed deposit rates likely to fall after the RBI rate cut, locking some money into medium term FDs may be a good idea.